It’s not that I’ve forgotten to post the last week or two. Really, I do remember that I should when I’m falling asleep on the couch, waking up to a cat wanting attention at 3am or in the middle of a meeting at work, but none of those are good times to sit down and write. I did make the chicken pie last week, and it turned out pretty good. For using what I had in the fridge, it was darn good. Do I remember what I did? No. Can I recreate it later? Probably not. But that’s ok because it will give me an excuse to try again soon. 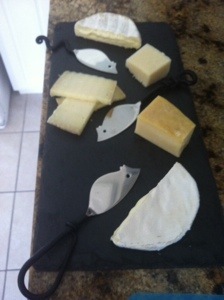 What we did do this weekend was our cheese box. Now regular readers will note we have more than three cheeses in this month’s selection and that is because we had company and I decided to pick up two more for the cheese dinner. John came down from Orlando and Leta came from work for thus month’s cheese box. We sat outside, ate good cheese, drank pretty good wine and just relaxed. Relaxing is underrated. 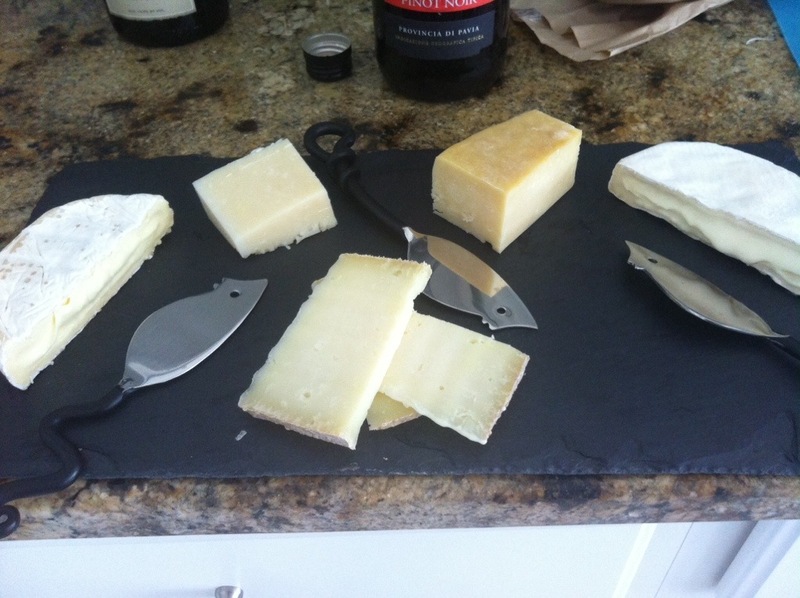 We started out with two soft cheeses – Green Hill from Sweet a Grass Dairy and Magnolia from … I’m not sure anymore. Both were soft, bloomy cheeses that had great taste and texture. The Magnolia was salty, almost too salty, but paired with a jam or honey it was beautiful. We had two Italian cheeses – a Pecorino Romano and a Toma that were great examples of their kind, but more cooking cheeses, although I did eat the rest of the Toma for lunch this week. The star of the show this month, however, was the cloth bound cheddar from Jasper Hill and Cabot. Cabot is a huge cheese producer and Jasper Hill is a tiny cheese producer. Combine these two and you get a cheese that is distinctive, tasty, easy to eat and will surprise you at every bite with how good it is. Obviously I am a huge cheese fan, but really I am a good food fan more. I like things that are interesting and different and even if I won’t go back for seconds, I can appreciate that it is good food. I’ve done this with entire dinners – love the experience if not every bite of food. I think this is why I love the Magnolia so much, it was different. Smooth and creamy but salty and tangy. It wasn’t what I expected so I enjoyed it more. Spring break is next week and I am so grateful to have a week off it isn’t funny. Once I head back to school it will be all testing until the end of May. I think I have the schedule worked out, but am waiting on final approval. Pretty much, I won’t see or speak to … Well, anyone, until the end of May. I might go stir crazy, but at least I won’t be near phones or email for a while. Hope everyone had a wonderful first day of Spring. I’ll refrain from including Dad’s spring poem. It’s better for everyone that way. Happy Spring!